Handicap Access is available through the northeast door on the ground floor (East Herrick Avenue). This service is available for wheelchairs, strollers, and disabled persons. Press the button for admittance and take the elevator to the first and second floors or basement meeting room. Any resident of Ohio with current photo ID (driver’s license) is eligible to apply for a Herrick Memorial Library card. If your photo ID does not have your current address, show us an alternate document, such as a utility bill or bank document. All applicants will be asked to provide their date of birth. We will issue you a Library card immediately. How can my child get their own Library card? Your child must be able to clearly write their complete name (first, middle initial, last) on the application form by themselves. A parent/legal guardian must be present to sign the back of the child’s application form for a full access card; making them responsible for any fines, overdue, lost or damaged items. Minors, ages 10, 11, 12, 13, 14, 15, 16, or 17-years old, without a parent/legal guardian present, may be issued a limited access card. A limited access card entitles the minor to borrow up to five (5) items, excluding DVDs, CDs, and other non-book materials. (Audio books are considered books.) All items on a limited access card must be returned before it can be used again. It is possible for minors, 10 to 17-years of age, to possess both a full access and a limited access card. First-time borrowers are limited to 5 items. All items initially checked out by a first time borrower must be returned before additional items can be checked out. After that, you may have 5 DVDs, 5 CDs, 5 magazines, 10 audio books, and as many as 50 books on your card at any time. All items, except Interlibrary loan items, circulate for 14 days and most are renewable 2 times. Toys, CDs, DVDs, magazines, and new books cannot be renewed. Interlibrary loan items are subject to the circulation period designated by the owning Library. You can renew Herrick Memorial Library materials by telephone, online or in person. We do not charge late fines for materials that the library owns. We do charge $.50 per late day for InterLibrary loan items. If I owe fines can I still use the Library and my library card? Once your fees (damaged items, lost items, etc.) reach $5.00, your borrowing privileges are suspended until the fees are paid. If you have overdue items, you cannot borrow additional items until the overdue items are returned or renewed if possible. Yes, we have since 2006. The Library is funded by taxpayer dollars and we see this as being responsible to our taxpayers. We do and we don’t. We accept newer, gently used fiction, nonfiction, children and teen books. We don’t accept tattered, mildewed and/or damaged books, college or high school textbooks, encyclopedia sets and years’ worth of magazines. What does the Library do with book donations? Once we take what we can use for your collections, the remaining books are passed on to the Friends of the Herrick Memorial Library. They sell them at their twice-yearly book sale. Damaged and unsalable books are recycled. The Library does not act as a recycle point for private individuals. What is the Friends of the Herrick Memorial Library? The Friends is a 501©3 non-profit organization that raises funds for the Library. The Friends underwrites the Library programming, supports the levy and provides volunteer opportunities for their members. For a modest membership fee, you can join the Friends. In 2015 approximately 54.5% of our funding was from the State of Ohio Public Library Fund. About 32.7% was a combination of local property taxes, state rollbacks and credits. Other donations, grants, and The Friends of Herrick Memorial Library accounted for 10.5%. Fines, fees, interest, etc., accounted for 2.3%. 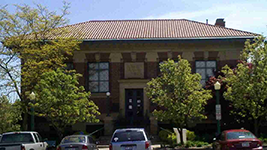 You can join the Friends and/or donate to the Herrick Memorial Library Endowment Fund, which is managed by the Community Foundation of Lorain County. The interest earned on the Endowment Fund is used to fund special projects, such as the purchasing of the computer projector and wall screen in the Community Room. You can search the Library’s collections, check the status of your account, personalize your PIN [Personal Identification Number], renew materials and place items on hold by clicking on my account on the home page; www.wellington.lib.oh.us, and entering the ID number from the back of your library card (no spaces), along with your pin. You may also use the password (aka alternate ID) that was set up when you registered for a library card, along with your PIN. Your PIN must be entered in lower case letters. What is a PIN [Personal Identification Number]? Every library card comes with a PIN that can be used to renew books, place holds and check the status of your account online. It can also be used to access time on an in-house internet computer. If you have forgotten or misplaced your PIN, you can retrieve it or change it in person at the circulation desk in the Library. PINs cannot be given out over the phone or to anyone who is not the card owner.